"His lack of orthodoxy is evident in his antipathy to both methodological individualism and methodological collectivism and his predilection for the transaction as the central focus of analysis but a notion of transaction utterly without the baggage that organization theorists usually expect (Williamson 1975). His main message is that there is no such thing as an organization: only ways of organizing and disorganizing and that there are only five ideal type ways of doing such activity: the hierarchical, the individualistic, the egalitarian, the fatalistic and the autonomous. … this is a book which is significant and should be widely read by organization theorists. It is in many ways a throw-back to an older style of theorizing – Talcott Parsons is mentioned in passing – but in an age when big-picture theorizing seems to be in retreat – in part because of the decline of the book as a resource for scholarship, which, in turn, is partly due to the triumph of science-based models governing research assessment exercises privileging the journal article – this book is a timely reminder of what a broad, reflective and theoretically coherent social science of organizations can offer. It makes a refreshing change from empiricist, mid-range theoretics, prepositional science fiction, and the multiple-regression of variables without rigorously coherent multivariate theoretical forethought that one sometimes finds in the journals; the marriage of cultural and organization theory could provide a very fruitful springboard for future research." Stuart Clegg, Journal of Organization Studies August 09 issue. "Until a few years ago the generic knowledge required by a local authority senior officer might have been of structures of governance, legal and financial systems, of organisational structures and change strategies. But to this we can now add an understanding of what drives human behaviour. Increasingly, we can expect local government leaders to draw on insights from fields such as behavioural economics, social psychology, social marketing, even anthropology and neuroscience. In this forest of new findings and perspectives, leaders need to identify which are the most useful ways of framing their understanding. One such framework is offered by cultural theory. This approach doesn't offer simple answers but it can help identify the right questions and, more importantly, give clues as to why some strategies are doomed to failure while others have a chance of success." "This theory has so many strengths, it is difficult to know where to start. In particular, I like the fact that Michael rejects the notion that human development has an end point in favour of the view that change always results through the 'clumsy' interaction of ways of thinking and behaving. Another insight is the understanding, when one or more of these views, is excluded the outcome is at best sub-optimal, at worst catastrophic. And it is this that I asked Michael to reflect upon, asking him to think about what cultural theory has to say about the banking crisis. My thesis, shallow though it might be, is that the crisis reflects what happens when those who dwell within and preach a monolithic culture are given too much power. All that mattered in the City was individualism; there was no egalitarian belief in a wider social or moral purpose for banking, nor was there any effective hierarchy as the rules didn't work, those notionally in charge were on a merry-go-round they could not get off (even if they wanted to) and no-one even really understood how the system worked." Matthew Taylor, Chief Executive of the RSA, London. 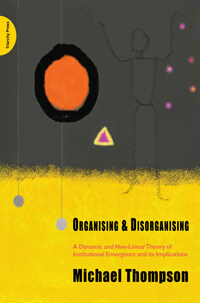 "I recently purchased Michael Thompson's "Organising and Disorganising". Wow! What a revelation - the thoughts and ideas, the clarity in the writing, even down to the idiomatic expressions and down-to-earth style - this is what great academic writing is all about. Michael - thanks for shedding light on organisational theory and introducing me to Mary Douglas that is a world away from stuffiness! Look forward to your next tome!" Ben Corringham, Postgraduate researcher at Wageningen University, Netherlands. "New leadership ideas and actions are particularly valuable when the going gets tough. A new book based on Culture Theory shows how to understand and overcome the local peak syndrome. There is a cartoon often shown during leadership programmes. It shows a mountaineer planting a flag on the summit of a mountain. But the drawing can be expanded to show what the climber had missed. He has reached a local peak, and the real challenge looms ahead. What's worse, he has to get off the local peak before he can start climbing again. It's a powerful visual image. .. The title may put some potential readers off. That would be a pity. Readers may be pleasantly surprised at the enjoyment and benefit to be derived by signing up for the expedition. For one thing, the author is a confident guide, and illustrates the journey by means of lots of interesting maps of other expeditions including investigations into environmental problems of the Napalese region, climbing expeditions, and (in some contrast) the move of Arsenal Football club from Highbury to The Emirates Stadium. The stories illustrate a rich version of cultural theory, and have implications for leaders of all kinds." "We introduced this book last week, but would like to return to it, given its importance..."